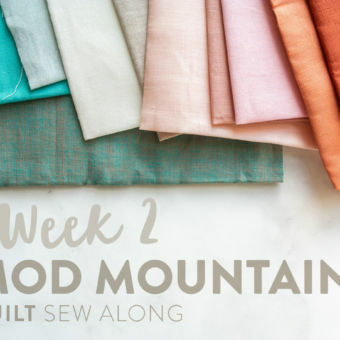 It was a rainy day in May and I was teaching a Sew Mojo Mini workshop (watch the video class here and get the patterns here) in Grand Rapids, Michigan (heeeeyo to my GR ladies!) My teaching style is, how to say this...mostly me giving loose instructions and then hopping around oooohing and ahhhhing over the splendid things everyone is making. I sprinkle in lots of jokes and dance moves – it’s a party! Anyway, in my afternoon sesh, while frolicking from table to table, I stopped abruptly in front of a shining and glorious mini quilt. It was magnificent for many reasons, but what caught my eye was the beautiful chunky quilting. It was like a high-tech embroidery machine got together with some traditional hand quilting and created a magical hybrid stitch full of texture and depth! “What weight is your thread?? I must know!” I breathily asked. I was in a trance. A love trance. 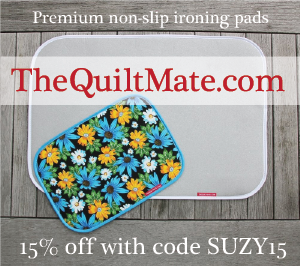 “I’m machine quilting with 12 wt. thread. Kinda cool, right?” Amanda, the maker of this glorious and magnificent mini quilt, casually replied. Well, there was nothing casual about my new infatuation with this chunk-o-licious stitch. I was smitten right then and there and vowed to use thick, lustrous 12 wt. thread on my next quilt. But, before diving into a full quilt, which I now have (more on that in a later post), I needed to run some tests. Veeery scientific tests. 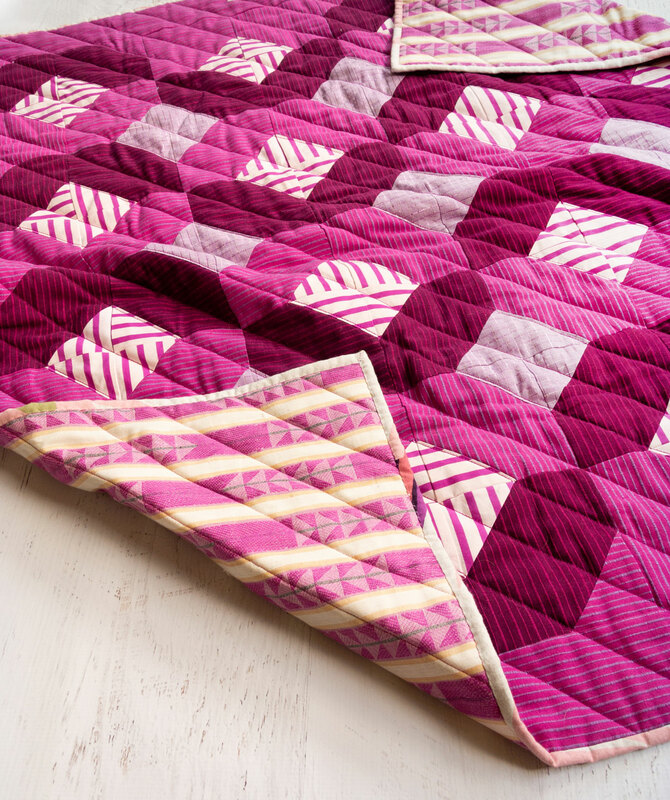 Get the Glitter & Glow quilt pattern seen here! 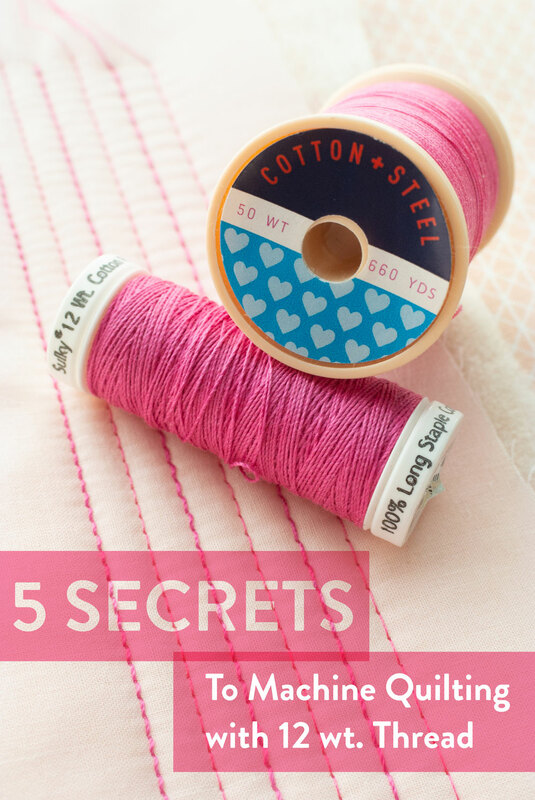 After many tests and much research, I discovered 5 secrets to machine quilting with 12 wt. thread which I would now like to pass along to you, my gentle reader. Ready for the magic? The Needle. Typically I recommend piecing and machine quilting with an 80/12 Universal needle. 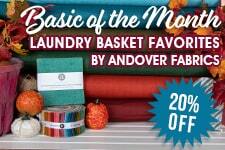 That's assuming you're using quilt-weight cotton and standard batting. When quilting with a thicker thread, like 12 wt., you're going to want to up that needle to be more heavy duty – like a 90/14. This will prevent your thread from breaking. The Bobbin. Even though you are using 12 wt. thread as your top thread, use your regular quilting weight thread in your bobbin. For me that's 40 or 50 wt. After checking out a couple different color combinations, I decided that what looks best is if I matched the top and bobbin threads. I don't always do that when machine quilting, but since I could see the bobbin thread ever so slighting in between top stitches, no matter how I adjusted my tension settings, I landed on simply matching the threads. The Tension. I was running my tests on a BERNINA 770 QE and did not need to adjust any tension settings. However, if you have a different kind of machine with completely manual tension, you may need to loosen your top thread tension. The key here is to TEST. 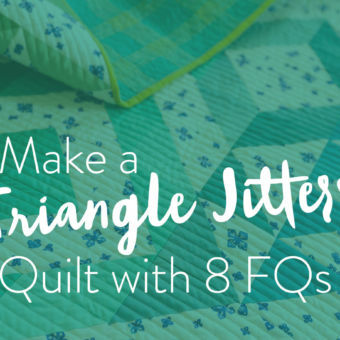 Make a mini quilt and test your settings. If the thread is breaking – your tension is too tight. Try adjusting your top thread tension before tweaking with the bobbin thread tension. 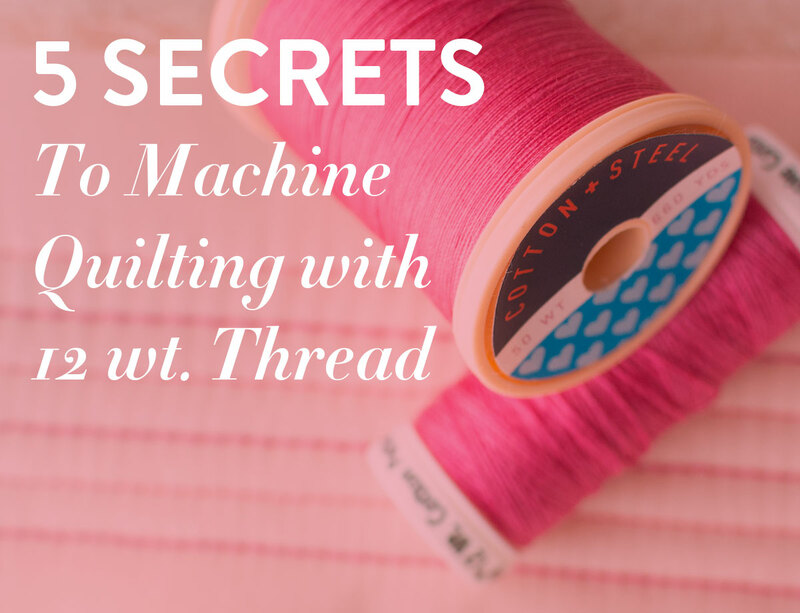 Chances are you won’t need to adjust your bobbin tension. The Stitch. 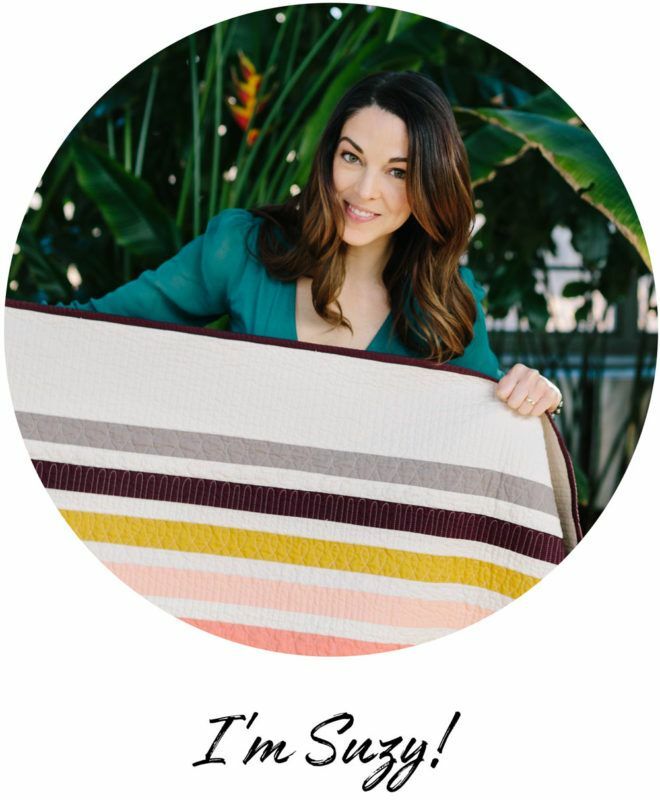 You don't neeeeed to change your stitch length from what you normally use when piecing or quilting, but you might want to based on the aesthetic you're trying to achieve. My normal stitch length is 2.5. I actually use that for both piecing and machine quilting. 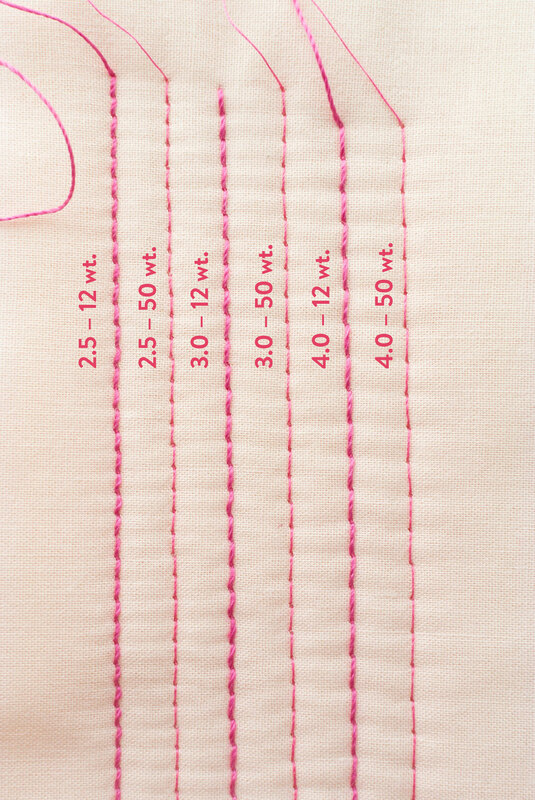 You can see in the example below what stitch lengths of 2.5, 3.0, and 4.0 look like. The Speed. It's slow. Just like I recommend "walking" with your walking foot, sew slowly when working with a thread this thick. 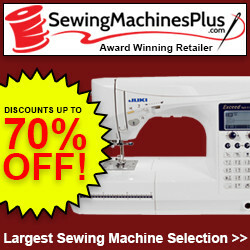 According to most sewing machines, 12 wt. thread is the thickest thread you can safely use in a sewing machine. That means that you are pushing your BFF to the limit. So? Slow and steady. Sulky 12 wt. 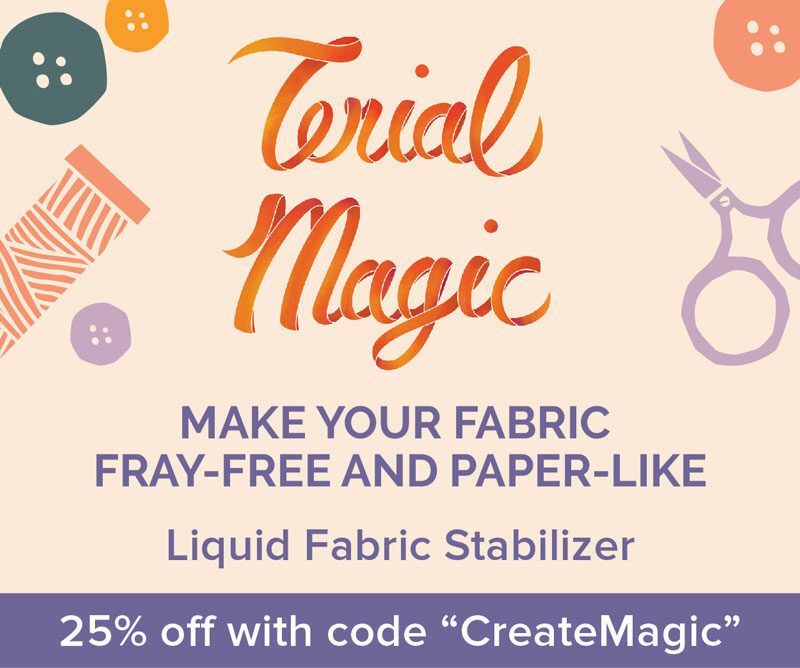 cotton thread – I actually got a huge pack of this thread a few years ago because I loved how soft and easy it was to work with. 90/14 Universal Needle – Read more about universal needles here! Quilters Dream Wool Batting – Want your chunky stitches to stand out even more? Use a batting that's got some fluff. Quilters Dream Wool Batting is what I use when I'm treating myself...and I treat myself a lot. Read more about choosing the right batting here! I like the slightly longer stitches. However,I love using an 80 or 90 Topstitch needle when quilting. Thank you for all these tips. It is so helpful to have someone who is doing this tell you some tips! Thank you! I love the look! You suggested to MATCH the top and bobbin threads. I presume you meant to match the COLOR? I LOVE the look of 12 Wt thread. Thanks for tips! That’s exactly right – match the color. Cool. Can’t wait to try it. I’m closing in on a 48” sq. quilt for which this will be exciting. Thx!! This is fantastic! Thank you for testing it all out for us and providing your scientific results! Do you ever use the hand look quilting stitches built into the QEE? 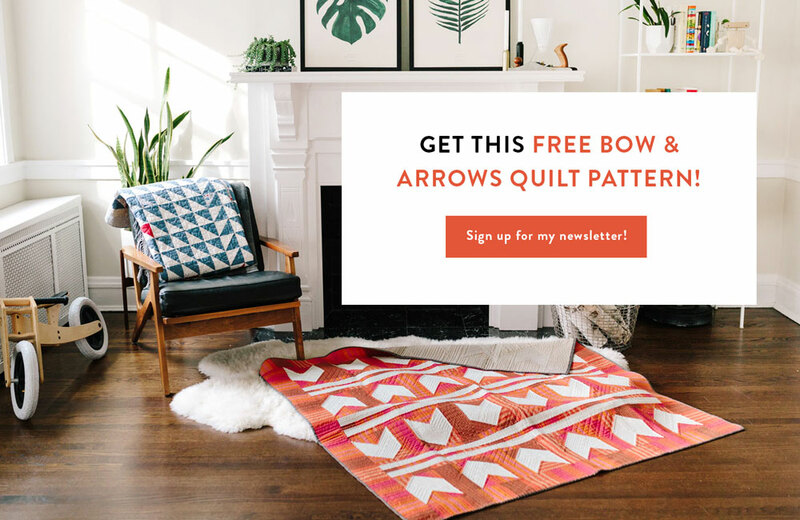 I’ve tried it…but maybe because I am a hand quilting fanatic, I just don’t really like the look. It’s possible I don’t have my settings correct. Do you use it? Terri, I have been very pleased with my results using stitches built-in to my domestic Janome. Great information! Thanks. 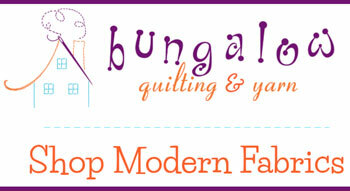 Did you know some prominent quilters/websites have “discovered” the Tailor’s Clapper tip to flatten seams? It happens all the time with your tips! 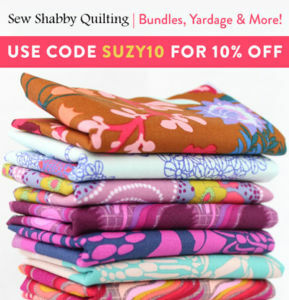 Keep educating the quilting community, Suzy! haha! I love hearing that! 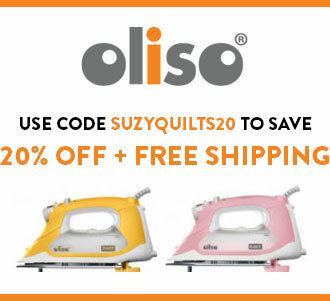 Suzy, when you are talking about quilting with the 12 weight are you talking about on a Longarm? I have a longarm and I’m hoping it would work on it, excited love the look. 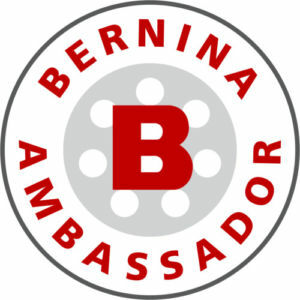 I am sewing on a domestic machine – a BERNINA 770 QE to be precise. Of stitch length is very helpful. 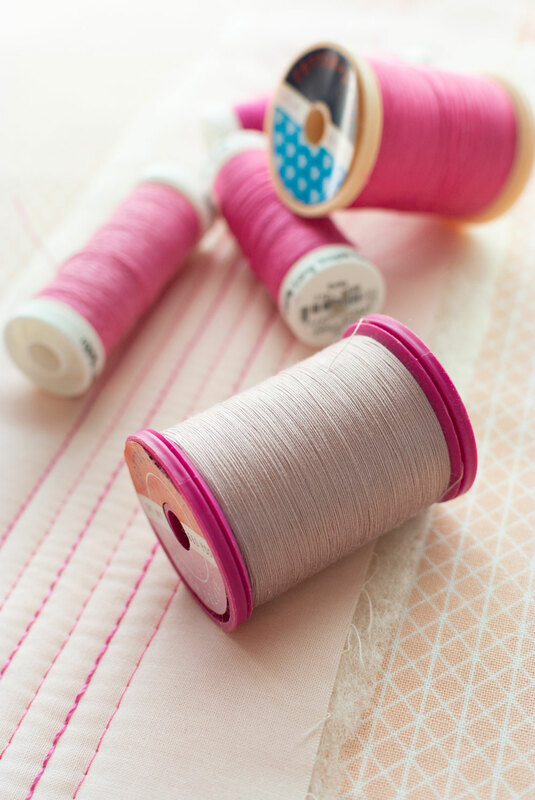 I wonder if you match the bobbin thread to the fabric you are stitching on if you will get a bit of a hand quilted look. Hi Suzy! 12 wt. is a wonderful look! I always use a needle with a larger eye for 12 wt. A metallic needle works well. The larger eye creates less friction as the thread runs through so not as likely to fray or break. Thanks for the great information about quilting with 12 wt thread. 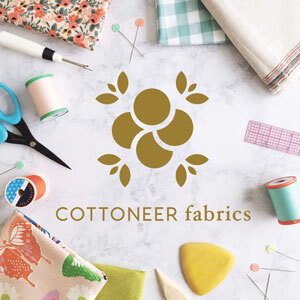 I’ve been using Superior Threads Sew Sassy 12 wt threads according to their recommendations to use on home/domestic sewing machines, a Topstitch #100/16 needle along with a top tension setting of 2.0. 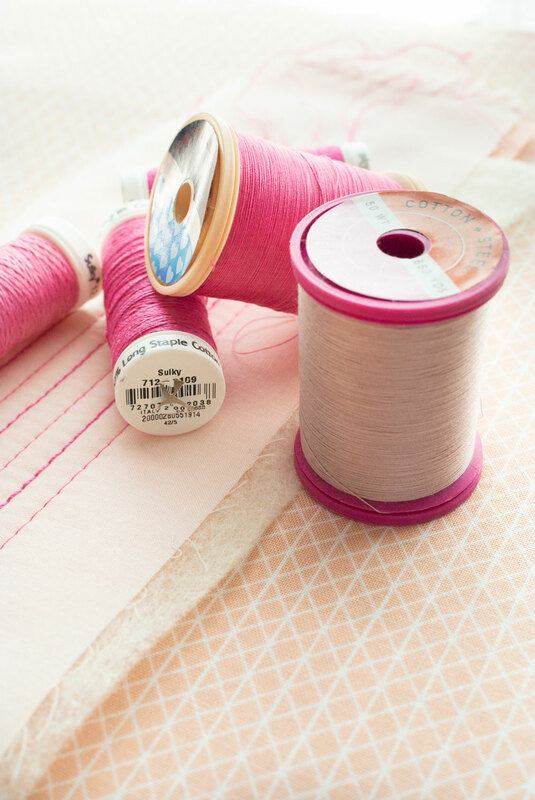 As you say, slow sewing is the key! It’s a great quilting look. 100/16 you say? I wonder if I could sew faster with a bigger needle like that…always looking for ways to speed up. haha! yes you can sew faster, but the eye of the topstitch is much longer than the universal or quilting needles. it is kinder to the regular threads of 50 weight….and would be much more suited to your 12 weight because of the larger eye. Love all this information! Can’t wait to try it! I do a lot of big stitch quilting with Number 8 embroidery floss, so I think I’d really love the results of the 12 wt. 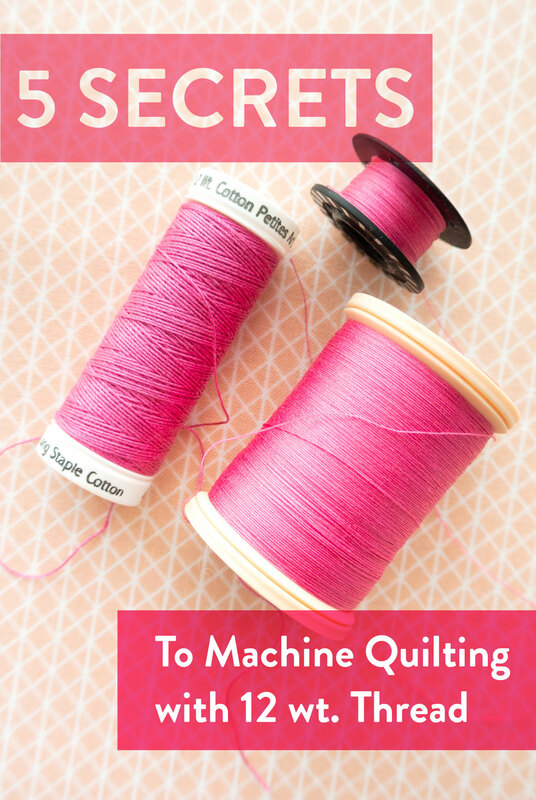 machine quilting. Thanks for sharing! Because I used 12 thread for seams with jeans fabrics … It’s been an absolute nightmare… I did a lot of tests by changing the tension of the needle and the bobbin, nothing worked, the bobbin thread always came out on the right side, and sometimes entangle or loose even with a tight tension. My husband told me to try with an old 70′ Singer sewing machine ! And the result was much more convincing ! I have used the singer several times since and it competes/completes well with my main 15 years old Pfaff machine (deutsch brand). 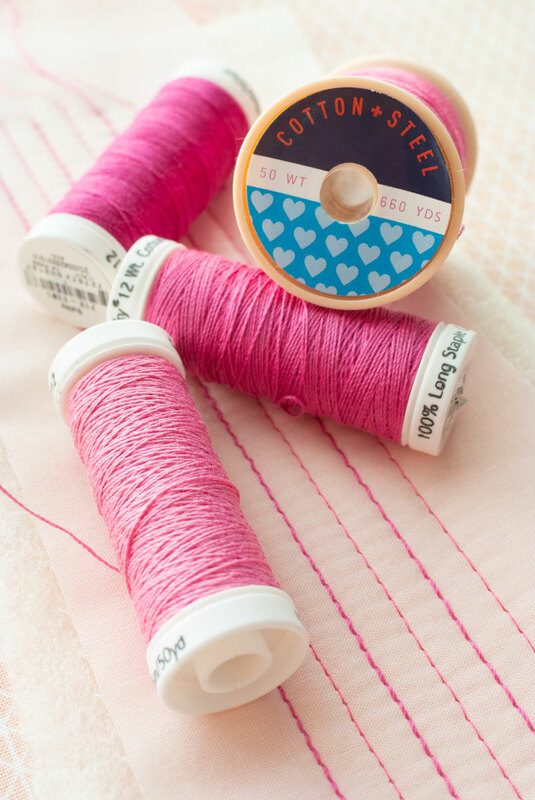 I never thought (dared) use a different thread for top thread and bobbin ! THANK YOU for all the tests and tips you give to us ! So helpful ! Merci ! I recently tried using Aurifil 12wt on a flannel (unbatted) baby quilt with a 5 stitch length and 100 needle and loved how it looked! I found that at the end of each row if I pulled the quilt out the usual way to cut the threads that they would fray/break. Well, they means one because I didn’t want that to happen again as I was tying them off and burying them so I needed long tails (no binding to later hide my edges…I just sewed right sides together and turned). Instead, I pulled down extra thread above the needle eye and then gently hand pulled it though the eye until the tail was long enough to cut. It’s fun to discover a chunkier look similar to hand quilting. Thanks for the tips! I’ve found a trick to avoid the fraying and braking problem at the end of a line of quilting. Staying in the seam allowance, just sew over to where your next line of quilting would be, and away you go! A little extra thread is used, but you won’t have any fiddling to do pulling extra thread through the needle and best of all, no ends to bury!! I used this method on a baby quilt. I used binding, but all my extra thread paths were automatically hidden once the binding was on. Im go glad this article popped up on Pinterest. I’m making a tablecloth from a vintage postage stamp panel I found at a sale. I was not planning on batting to keep the bulk down and have it backed with some vintage linen. With dimensions of 48×72 it’s nice to hear I have options than doing this by hand. I tend to use a lot of Aurifil in my machine, Sulky 12 wt. for hand binding, and DMC pearl cotton #8 thread when hand quilting. I have a Juki 2010 so I am able to adjust tension & presser foot. I am actually able to use #10 cotton crochet thread & leather needle (110/16?) in my machine. I use it on bags that I make. I use a really long stitch. 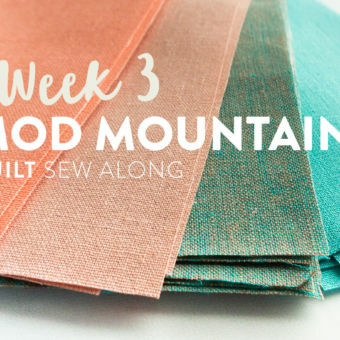 It sure looks like the modern quilting stitches & the chunky thread is awesome! Thanks for the helpful insights. I would love to give finish with a machine to my quilts. I started making a baby quilt and I use an invisible thread by Gutermann 100%Polamida and when I felt the other side it was ruff and brittle can you tell me What would be the best way to handle that. Invisible thread is like sewing with plastic – it’s not going to be soft. If you want an invisible look, but the soft feel, I would suggest matching your thread to the fabric as best as possible. I just hand quilted my first quilt using a sashiko style, needle and 12 wt thread. This will be the perfect style to bind my quilt! I’m doing the binding by machine and backwards so these stitches will be on front!!!!!!!!!! My hands need a rest!!!!!!!!!!!!!! !